On the 7th (Tue), enjoy the sand and surf at Cesme AltInkum Beach, delve into the distant past at Cesme Castle, and then raise your glass at Babylon. To find ratings, reviews, maps, and other tourist information, go to the Cesme trip itinerary planner. Jeddah, Saudi Arabia to Cesme is an approximately 10-hour flight. The time zone difference when traveling from Jeddah to Cesme is minus 1 hour. Prepare for slightly colder weather when traveling from Jeddah in August: high temperatures in Cesme hover around 36°C and lows are around 27°C. Finish up your sightseeing early on the 7th (Tue) so you can go by car to Selcuk. Deepen your sense of the past at sights like Ancient City of Ephesus and The Terrace Houses. Your cultural itinerary includes sights like Celsus Kutuphanesi and Public Latrine. And it doesn't end there: steep yourself in history at Meryemana (The Virgin Mary's House), don't miss a visit to Arcadian Way, delve into the distant past at Cathedral of St.John the Evangelist, and see the interesting displays at Ephesus Museum. To find reviews, where to stay, photos, and tourist information, go to the Selcuk trip itinerary maker app . Traveling by car from Cesme to Selcuk takes 2 hours. Alternatively, you can do a combination of bus and train; or take a bus. The time zone difference when traveling from Cesme to Selcuk is 1 hour. While traveling from Cesme, expect a bit warmer days and about the same nights in Selcuk, ranging from highs of 41°C to lows of 26°C. Wrap up your sightseeing on the 10th (Fri) to allow time to drive to Pamukkale. 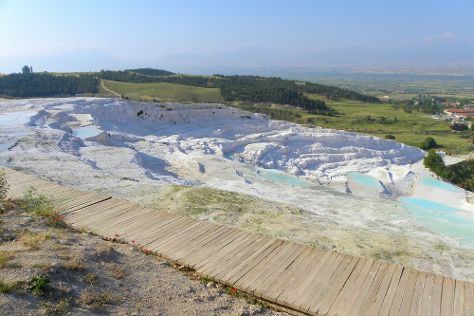 Kick off your visit on the 11th (Sat): head outdoors with Road to Pamukkale, take in the natural beauty of Pamukkale Thermal Pools, and then delve into the distant past at Hierapolis & Pamukkale. For traveler tips, reviews, and more tourist information, refer to the Pamukkale vacation planner. Traveling by car from Selcuk to Pamukkale takes 3 hours. Alternatively, you can take a train; or do a combination of bus and taxi. Cap off your sightseeing on the 11th (Sat) early enough to go by car to Oludeniz. Start off your visit on the 12th (Sun): kick back and relax at Blue Lagoon and then kick back and relax at Blue Lagoon (Oludeniz Beach). For ratings, photos, other places to visit, and more tourist information, read our Oludeniz road trip planner. Drive from Pamukkale to Oludeniz in 3.5 hours. Alternatively, you can do a combination of taxi and bus; or do a combination of taxi and bus. In August, daily temperatures in Oludeniz can reach 38°C, while at night they dip to 24°C. Wrap up your sightseeing on the 12th (Sun) early enough to drive to Dalyan. On the 13th (Mon), explore the ancient world of Lycian Rock Tombs, then delve into the distant past at Kaunos, then delve into the distant past at Dalyan, and finally kick back and relax at Iztuzu Beach. To see traveler tips, reviews, photos, and other tourist information, go to the Dalyan trip planner . Drive from Oludeniz to Dalyan in 1.5 hours. Alternatively, you can do a combination of taxi and bus. 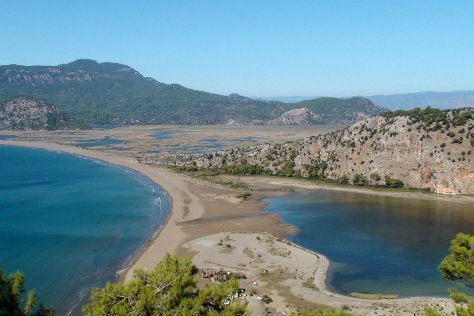 In August in Dalyan, expect temperatures between 38°C during the day and 24°C at night. Finish your sightseeing early on the 13th (Mon) so you can travel to Istanbul. Do some cultural sightseeing at Sultanahmet District and Topkapi Palace. Your itinerary includes some good beach time at Dalia Beach and Suma Beach. Next up on the itinerary: admire the landmark architecture of Hagia Sophia Museum / Church (Ayasofya), take in the spiritual surroundings of Suleymaniye Cami , take a stroll through Ortakoy, and tour the pleasant surroundings at Florya Sahil Parkı. For photos, ratings, other places to visit, and other tourist information, you can read our Istanbul road trip planner. You can do a combination of taxi and flight from Dalyan to Istanbul in 4 hours. Alternatively, you can do a combination of taxi, flight, and bus; or drive. Traveling from Dalyan in August, you will find days in Istanbul are a bit cooler (34°C), and nights are about the same (25°C). Finish up your sightseeing early on the 19th (Sun) so you can travel back home.